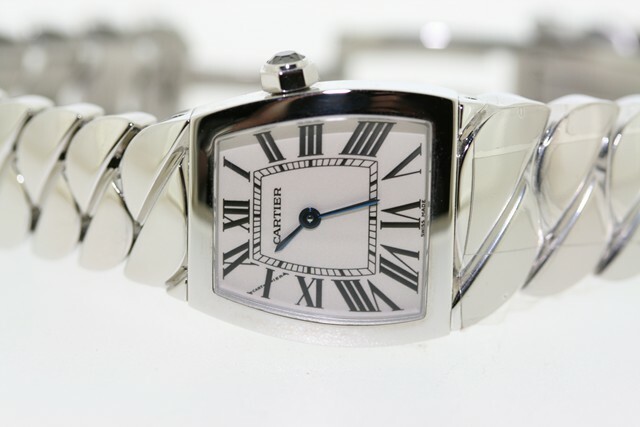 If you have decided to spoil your wife this year for Christmas, you probably want to take a look at this fabulous Cartier watch. Cartier is a premier watch maker and has been so for nearly 150 years. As the jeweler to Kings, Cartier watches remind us of royalty and luxury. The Cartier Watches La Dona Women’s Timepiece # W660012I has to be one of the most interesting and beautiful designs in their collection. The La Dona has a unique structure. Created after the celebrated Mexican film star, Maria Felix, the La Dona collection is curvy and feminine. This model has a Swiss Quartz movement and is battery operated. The silver guilloche dial is embellished with the traditional black Roman Numerals that Cartier is famous for. Of course, Cartier used a sapphire crystal to cover the dial and encased the watch movement in stainless-steel. The case back is a screw down style, helping to keep the La Dona Women’s Timepiece # W660012I totally water resistant to 99 feet. The unusual dial shape and bracelet design are what sets the La Dona apart from the rest. Both the bezel and bracelet are polished to a high shine finish and closed with a deployment clasp. The Cartier Watches La Dona Women’s Timepiece # W660012I…the perfect way to indulge her this holiday.